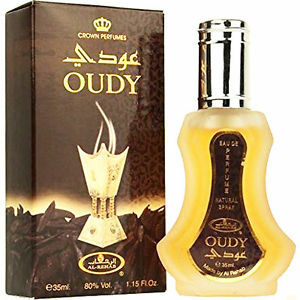 Oudy is classic, a wonderful fragerance, not too strong, but it does last all day. Made by Al-Rehab, one of the Middle Easts premier perfume manufacturers. 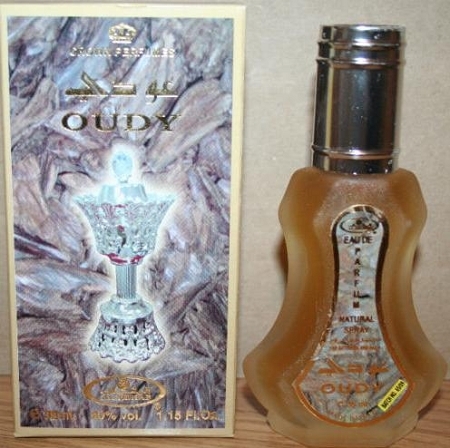 I was first introduced to this scent when I lived in Riyadh, KSA, many years ago, and fell in love with the scent. I love the complexity, uniqueness and quality of the Middle Eastern fragrances, and this is no exception. If you like the smell of Oud incense, give this a try. Oud mukhallat with olibanum, saffron and woods accord blended into a warm, scintillating scent. Lasts all day, especially if put on clothing! Definitely unisex (wife absolutely loves it). I have more than 450 colognes, and Al-Rehab's are among some of my favorite. The price v. quality quotient is very high. Al-Rashad's offers the BEST pricing I've ever found, and their service is excellent! HIGHLY recommended business establishment! This is a wonderful scent in a handsome container. For sure, this is a scent to add to any man's collection. Thank you for your attention to my needs. May Allah bless you & your company.